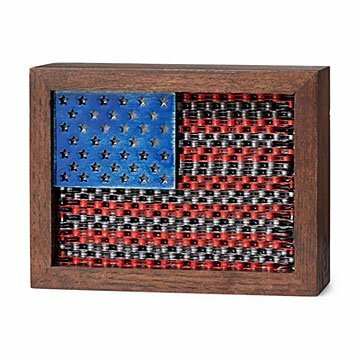 These folk art American flags are made from upcycled bike chains. There's no better way to enjoy the expansive beauty of this great country than rolling down the road under your own pedal power. This handcrafted flag is a salute to both our love of home and of the road. They're each made from reclaimed bicycle chains, spruced up after years of travel, trimmed, painted, and assembled to form a folk art stars and stripes. The metal flags are given a clear polymer coating to preserve their color and mounted in a sturdy oak frame that will keep them standing tall on your desk, countertop, or bookshelf. Handmade by Rachel Spire in Grapevine, Texas. An artist and furniture designer from Grapevine, Texas, Rachel Spire is providing a fresh spin on old gear. As a furniture designer by trade, artist and avid cyclist by nature, her three passions collided in the garage with a handsome stack of reclaimed wood and a bucket full of bike parts. Every day leads to a new creation...ride on. Beautiful piece of art ~ so grateful that it's made in the USA. It's being used as a Christmas gift. I am so excited for the recipients to see it. I thought the product would be a little bigger once he put it out I realized it was actually the perfect size for the space. It is sturdy and really a beautiful item. I love it. This is a really nice product for my father who loves tinkering on bikes. Perfect decoration for his garage where he does the work. I can't wait to give it to him. Keep in mind the dimensions are slightly smaller than your standard piece of paper when ordering. It's not like poster sized wall art, more like framing a standard 8"x10" picture. This USA bicycle chain flag will be displayed in a home office. Because the recipient loves to ride bikes, it ties in his love of country with his love of cycling, thus creating the perfect gift. He really liked it, we have it displaces on one of our bookshelves in the family room. Artwork is being given as a celebratory award for completing a coast-to-coast bicycle trip. The use of the bicycle chain to make the USA flag is so appropriate to commemorate this cycling accomplishment.